New Helmet to Improve Soldier’s Safety. Images of China’s New Carrier-Based J-15 Surface. Apaches Get Ground Fire Detection System. NG Begins Testing New Multi-Function Active Sensor. Raytheon Wins Artillery Shell Deal. Energy Weapons Arm Ships. Russia Successfully Test Launches Ballistic Missile. Raytheon Awarded Contract for Patriot Missile Upgrades. New Army Lakota Helicopters Loaded with Gear. SAAB Wins Order for New AT-4 Upgrade. Indonesia Launches Fast Missile Boat. Rafael Develops “Silver Sparrow” Missile. 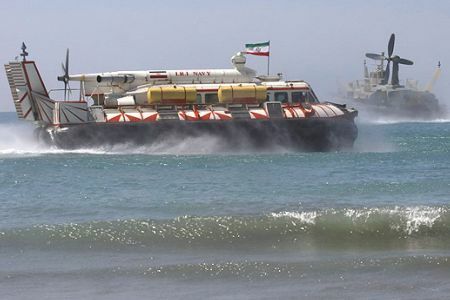 Iran: What's Next? Missile Motorcycles? The French are doing superb in the no-fly zone air to ground war. Wait, I’m defending the French? I am going though withdrawal. My hands are beginning to tremble uncontrollably. Beads of sweat trickle down my forehead. I am hot and uncomfortable. Pacing around the house helps, but my mind remains restless. It could be for financial reasons. It could be for obtaining information on customers. It could be for bragging rights, but whatever the case may be, it got hacked. I received an email from Sony today informing me of some awesome news(sarcasm). No, the network won’t be back up. It was a bit more concerning to me and I’m sure everyone else who received the same message. The hacker or hackers have all the information about where I live, my name, and email, but that really doesn’t bother me. What is bothersome is the fact that my credit card information was potentially stolen from the network. So now that I have been informed by Sony to keep an eye on my bank statements, I gotta wonder why I ever bought (using my credit card on the PlayStation Network) those additional maps for Call of Duty: Black Ops? It is now personal. Someone stole from me. No strange purchases have appeared on my statement as of yet, but the thought of whoever did this selling the numbers and information to whoever does want to use them to make purchases angers me. I am for the first time victim of cyber theft(that I know of). I don’t think anyone can disagree with me that the future of warfare is going to take place behind a computer screen and not staring down the sights of a rifle. I see this theft as having someone enter my home, open my wallet, pull out my credit card and write down all the information on it, put it back in my wallet, and walk out the door. I must confess, if this were to be attempted tonight as I type, my firewall wouldn’t be hackable. China currently keeps a firewall over its citizens, known in the West as “The Great Firewall of China.” It prevents outside websites such as the NY Times, Youtube, facebook, and twitter among others to reach the user in China. This is to prevent the outside world to view what goes on throughout China, and more importantly to the Government, let the Chinese people see how the free world lives. There are occasional breaks in the firewall, but the Chinese government is quick to patch them back up. Why didn’t this hacker bring down the Chinese firewall? 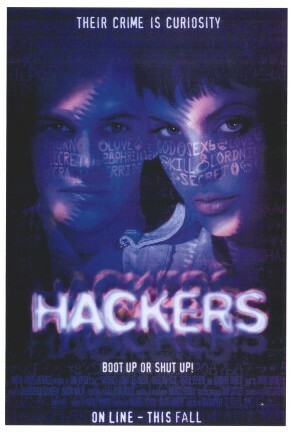 Why not do something noble and be a true hero hacker? If you are given this ability to write and design programs and do whatever you want with them, why not put them to good use instead of stealing credit card numbers for profit? Everyday, United States government agencies are steadily under cyber attack. Most of the hacks are traced back to somewhere in China, and after that little can be done. A couple of years ago, the small Baltic country of Estonia was hacked bringing all major networks down. The Estonians claim it was the Russian government who did it in effort to show the Estonians who’s still the boss of the area. Cyber warfare isn’t going anywhere. I believe that the next war may be fought over such a hack. If a nation like China is able to hack through our defenses and obtain top-secret information on our military weapons, is that not a reason to go to war? If they shut down our networks, essentially stalling our way of life, is that not a reason to go to war? Think of it as something like how a naval blockade would work. A blockade works by cutting off fresh supplies, essentially starving the opposing side into submission. A network hack would work in the same way, stopping life and creating absolute chaos. Since the world is relying more and more on computers, it becomes easier to disrupt our lives with one complex hack. It is going to happen eventually, people are trying hard everyday to do it. This minor hack(as of yet) that has effected my life opened my eyes to the real possibility of a massive hack interfering not with just 77 million users, but over 300 million. Maybe it is a nice break for me though. Instead of spend the two hours a night electronically slaying other people, I can find some other hobby to pick up. In the meantime, I’ll be watching my bank statements looking out for bizarre purchases from some dark area of the earth. I’m sure everyone remembers being a youngster fishing with your father, older brother, or elder friend of the family. You are briefly taught how to cast, which usually turns out to just be a 1 foot plop-drop over the side of the boat splashing down into the water. 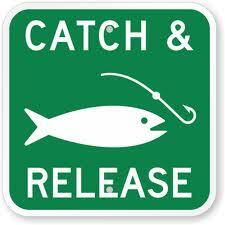 Suddenly, you feel a hard tug on the line and the sound of the reel as it begins to take drag. You begin to jump around in excitement holding the rod in one hand (or in my case, let go of it) not knowing that hooking the fish is half the battle. Your experienced other comes over to guide your arms sturdily back onto the rod and rotates your hand on the reel clock-wise while speaking words of encouragement. The feeling you’re experiencing is similar to opening a present on Christmas or your birthday. After 10 seconds of fighting with the fish, up come the mouth and eyes with the body flipping and splashing. You’ve done it, you have caught your first fish, the biggest fish in the world. But after all the excitement, come the words, “Sorry, we gotta throw this bass back, she just ain’t big enough, son.” You begin to tear up and question the decision in a tantrum. To the response, “Don’t worry, this bass is just a baby, in a couple of years, we are gonna come back here and she will be all grown up, and we will catch her again, this time for keeps.” Habeas corpus was granted to the bass and it was released. Said Shihri, who was captured in Pakistan in late 2001 and became one of the first suspected terrorists held at Guantanamo Bay, was released six years later after he convinced U.S. officials that he would go home to Saudi Arabia to work in his family’s furniture store. He emerged instead as the No. 2 leader of Al Qaeda in the Arabian Peninsula, a Yemen-based group that U.S. intelligence considers the world’s most dangerous terrorist organization. Review panels at Guantanamo Bay also released at least six other detainees who later joined the militant group that has turned Yemen into a key battleground for Al Qaeda. One former detainee now is a prominent radical cleric, and another writes propaganda in English encouraging others to attack the United States. At least a dozen former Guantánamo Bay inmates have rejoined al-Qaeda to fight in Yemen, The Times has learnt, amid growing concern over the ability of the country’s Government to accept almost 100 more former inmates from the detention centre. The Obama Administration promised to close the Guantánamo facility by January 22, a deadline that it will be unable to meet. The 91 Yemeni prisoners in Guantánamo make up the largest national contingent among the 198 being held. Six prisoners were returned to Yemen last month. After the Christmas Day bomb plot in Detroit, US officials are increasingly concerned that the country is becoming a hot-bed of terrorism. Eleven of the former inmates known to have rejoined al-Qaeda in Yemen were born in Saudi Arabia. The organisation merged its Saudi and Yemeni offshoots last year. President Obama, who was in favor originally of closing the Guantanamo Bay detention camp, has acknowledged the true threat of this reality. The facility will now be able to resume trials of suspected terrorists. Yes, there may be a prisoner who is innocent. But I find it is doubtful that the individual was arrested and brought all the way to Guantanamo Bay for little reason. Is there a risk of this guy potentially being responsible for the murder of hundreds upon release? If there is even a 1% chance of that, then he should be held for as long as it takes to be a 100% sure he is innocent. It is not that hard when all of the guys they bring in live by the saying, “I want to die more than you want to live.” Let them die in a cell without harming people that enjoy the gift of life. This isn’t for instance, a group of four guys get pulled over, while only the driver has marijuana on him, all go to jail under suspicion that it belonged to everyone. That is not how it works. If you are rolling around with Al Qaeda members in Afghanistan, you are certainly assisting them. When the Toyota truck gets pulled over, and three of the four guys have AK-47s, while a rocket-propelled grenade launcher is under your seat, but you claim it’s not yours, you might be going to jail for a while. But who knows, maybe you will be one of the lucky ones who pull off a mass escape like the one that just occurred at Sarposa prison in Kandahar. 480 inmates escape out a Taliban dug tunnel. This poses a massive threat to Afghan and US security forces. Fortunately, the guards weren’t stupid enough to allow the prisoners to transfer the dirt around the prison in their trousers like in the film, The Great Escape. Nah, they just dug from the outside and used a good old fashioned car jack to break up the concrete, making a hole to crawl through. Libyan rebels in a street battle in Misrata. These guys are going to need more than air support(and from the way they shoot at targets, a lot of ammunition) if they want to make it through August alive. At least they are protective of their hearing. She was first bought from Ukraine in 1998 as one of the two Kuznetsov class aircraft carriers ordered for production by the Soviet Union in the 1980s. Due to major budget cutbacks at the collapse of the USSR, the “Varyag” was up for auction to the highest bidder. The purchase, originally under the conditions that it was going to used as a casino and hotel by a Hong Kong travel agency, quickly changed when the agency was denied access to rest in the Macau harbor. Government officials stepped in and it was now in hands of the People’s Liberation Army Navy. After slowly towing through the Black Sea, down the Suez canal, through the Indian ocean, and up the Chinese coast, she finally made the long journey to Dalian, where the Varyag was put into dry dock for examinations and refurbishment could begin. China has made it clear that it wants a more powerful influence in the Pacific and the ability to stretch even further. Essentially from a green water Navy (operations are limited close to shore) to a blue water Navy (the ability to reach anywhere on the globe, like the US Navy). 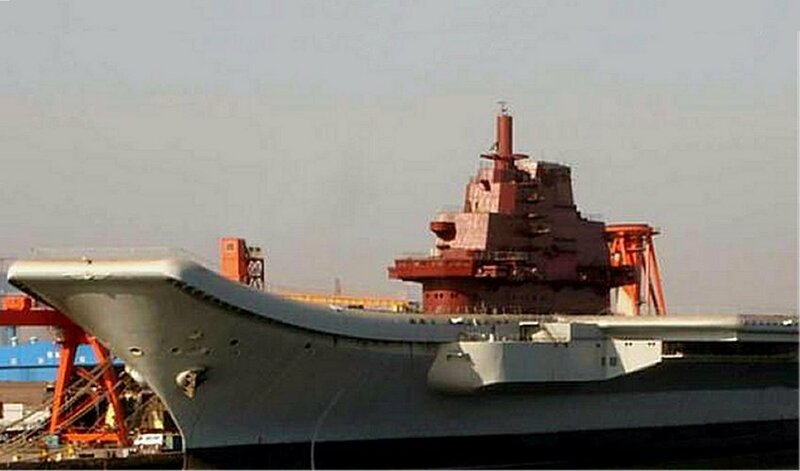 According to Taiwan official Tsai Teh-sheng, head of the island’s National Security Bureau, said “Varyag – a half-completed Soviet-era aircraft carrier Beijing obtained from Ukraine in 1998 – is expected to make its maiden voyage before the end of 2011.” It is also ready to begin live training exercises in that same time. PLAN pilots have already begun training on a mock land-based flight deck of the Varyag at Dalian. Defense systems were finished this year, giving her the ability to defend at incoming surface to surface missiles. I don’t believe there is going to be much to expect from the Varyag. What is interesting though is the newly reported name, “Shi Lang“. Shi Lang was a Chinese admiral who conquered Taiwan in the 17th century. If that doesn’t send a message to the Taiwanese, I don’t know what does. I don’t think the PLAN is really that stupid to rush this project into completion. Training pilots to fly and perform carrier operations is no easy task, even with modern technology. Ask any country who operates aircraft carriers and they will tell you it ain’t easy. You better have some money and lives, which the Chinese certainly do at this point. It took Americans around 20 years and a lot of lives, when operating with a prop plane to get it right, and around ten years and even more dead men, with jets. It will be interesting now that as Americans learn how to safely operate drones from carriers, the Chinese with jets. A race into a next capability of warfare for both sides. I suggest America step it up. The Chinese are going to take their time. Construction on an indigenous carrier is underway. She will likely be built by seeing what they liked, and what they didn’t like, and what worked, and doesn’t work on the Shi Lang. The Shi Lang is probably going to be more a of a political statement (making the inhabitants of Formosa lose sleep) than an actual factor in international policy. They will use it to train and operate on in preparation for the next decade to come, while constructing new carriers. On March 19, the United Nations Security Council Resolution 1973, issued a military interdiction upon the Libyan regime under Muammar Gaddafi. Hundreds of Tomahawk cruise missiles were launched by a coalition of US, British, and French frigates and fighter-bombers. The initial attacks were precisely targeting Gaddafi’s rotted integrated defense systems consisting of Russian made surface to air missile sites and radar installations. Most importantly for the coalition, was the naval blockade of Libya’s strategic Mediterranean ports, preventing supplies from reaching Gaddafi’s forces. Surprisingly, French fighters led the air to ground attacks using their untested Rafale fighter-bombers. Tactical targets included tanks, armored cars, and Gaddafi’s logistical supply lines. This consortium of attacks is known as a no-fly zone. In the opening stages, all of Gaddafi’s armor and defense systems were missile bait. The now NATO backed Rebels were able to achieve massive land gains westward from their stronghold in the eastern city of Benghazi. Videos began popping up across the internet of rebel forces capturing (and sometimes the appearance of torturing) forces loyal to Gaddafi. Gaddafi has made himself a rich man since taking power in 1979. With his aquired wealth, and promises of even more payouts when the rebels are crushed, the Libyan armed forces are consisted of many mercenaries from various tribes in the southern part of Libya and across the border in neighboring Chad and the Central African Republic are a majority. Most of these mercenaries are experienced fighters in various skirmishes from where they originate. Even with all the bombs from above, their experience is beginning to show. Adaptation. If you leave a creature alive long enough in a particular environment, especially hostile, it is going to evolve. This is what now, 19 days after the first initial strikes, we are beginning to see. Not getting killed from the air works this way, don’t be seen, blend into your surrounding environment. It appears now that Gaddafi’s forces are sending fully loaded jets, back to their bases, with all their bombs. The coalition is having trouble acquiring targets. Enemy use of reported civilian human shields are surfacing, swaying the coalition from firing on targets. The Loyalist forces appear to be turning in their armored APCs for civilian Toyota trucks armed only with a .50 caliber machine gun. They are now moving undetected and masking themselves from appearing hostile. Loyalists may now engage the rebels, while appearing to be rebels. A couple of days ago a rebel truck column was attacked for firing into the air in celebration of NATO aircraft flying overhead, resulting in the death of several rebel fighters. Why are the Loyalists doing this? They are doing what they have to do to beat a no-fly zone. Government forces are currently retaking ground back from the rebels. Rebels are complaining now that the airstrikes have scaled back and are becoming ineffective. But how effective have no-fly zones been? Let’s back track a bit shall we? 13 years ago the United States found itself in a similar situation. On October 31st, 1998 President Bill Clinton signed an act that issued support for the anti-government forces of Saddam Hussein’s Iraq. Saddam was also charged for ceasing production of WMDs at facilities which he had been banned from doing after Operation Desert Storm in 1991. Garnishing public support and US Congress to legitimize the attack, Operation Desert Fox was authorized. Assault from missile frigates launching Tomahawk cruise missiles along with Naval aircraft began on December 16th through the 19th wiping out Saddam’s interior defenses. A ceasefire was reached after 4 days of heavy bombing. Saddam remained in power. Before Desert Fox was underway, Operation Northern Watch began on January 1st 1997. Coalition aircraft from the US, Britain, and Turkey were now responsible for attacking aggressive Iraqi units violating the terms of a no-fly zone that restricted Iraqi military aircraft to operate only between the 33rd and 32nd parallel. Coalition aircraft were often fired upon by Iraqi SAMs, but they were unsuccessful in their attempts to down them, leading only to a counter-attack and the battery’s demise. Operation Northern Watch would continue through Desert Fox and all the way up until the invasion of Iraq in March 2003. Saddam remained in power through this time. Let’s go back a little bit further. (Lost yet?) In April of 1991, after the defeat of the Iraqi army following Desert Storm, a no-fly zone was implemented to protect the Iraqi Kurds in northern Iraq and provide a clear airspace for humanitarian aid. Operation Provide Comfort began. The Kurds fleeing from the Iraqi military were protected by coalition aircraft. Fresh in the minds of US officials was the 1988 chemical gas attack of Iraqi Kurds by Saddam Hussein. A similar situation wanted to be avoided. Operation Provide Southern comfort would last until 31st of December, 1996 with Saddam still in control of Iraq. 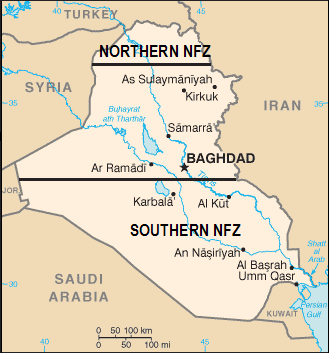 Others major no-fly zone operations over Iraq were Operation Southern Focus, and Operation Southern Watch. The giant picture we have overall is a 12 year no-fly zone over Iraq in a way to pacify Saddam Hussein and protect anti-regime forces. It was not until the 2003 invasion of Iraq by coalition forces that a no-fly zone ceased to exist since the ceasefire in 1991. 12 years of lobbing in missiles, dropping bombs, gassing up fighter jets, maintaining those fighter jets, and providing logistical support for bases operating in the area including Naval vessels. The coalition literally carved two areas of the country out from Baghdad’s true grip. During the 12 year no-fly zone, Iraq maintained a conventional military style of war machine. Military and Paramilitary units still wore their service uniforms and operated in military combat specific vehicles(this of course all changed after Saddam’s fall.) Identifying targets for US or allied aircraft was relatively simple. Friendly fire was all that would make a pilot hesitate before pressing the trigger. Two US military Blackhawk helicopters were mistaken as enemy targets and downed, resulting in the deaths of US servicemen. No-fly zones appear to be a temporary and purely tactical operation. How the no-fly zone implemented in Libya will evolve, is entirely up to NATO at this point and beyond that is pure speculation, or is it? US citizen support for the operation is unpopular. We don’t want another Afghanistan or Iraq on our hands. Many Americans support an immediate withdrawal from both fronts. How much American blood does an operation like this cost? How long will it last? What is our ultimate goal? From what we can see now, the rebels are extremely unorganized and some have no military training whatsoever. Reports are surfacing that US, UK, French and even Egyptian special forces are already operating on the ground. Just as we saw at the beginning of operations in Afghanistan, CIA and special forces were the first on the ground to find out the who’s who of the rebels, and of course call in the airstrikes. After we find out who the top dogs of the rebel forces are, only then can we truly begin supporting them. Initially, people were urging instead of the US intervening the no-fly zone, to issue man portable air defense weapons to the rebels. Heck, it worked in Afghanistan for the Mujahedeen fighting the Soviets, why not Libya? It probably would have been a quick fix for Gaddafi’s air force, but Libya is not Afghanistan. It is flat, and open desert with the majority of the 6 million people living near if not on the Mediterranean. There is one major highway that links the north running from east to west. With Loyalist forces now dressing as rebels, driving technicals (pickup trucks tricked out with a machine guns or AA guns) and use of human shields, is causing NATO to face a predicament that has brought operations down to a near standstill. If the bookies in Vegas are taking bets on whether the United States has troops on the ground, versus maintaining strictly on a no-fly zone, the odds are becoming more and more likely on the US putting troops on Libyan sand. Despite President Obama’s decree that no US forces will go ashore, one thinks of the line from the US Marine hymn, “the shores of Tripoli.” US Marines along with local mercenaries, successfully stormed Tripoli during our war with the Barbary pirates marking the first time the American flag was raised on foreign soil. Will this be the ultimate fix to ridding Libya of Gaddafi? Though the first Barbary war gradually led to the second Barbary war, it did open the strategic shipping lines the young US relied on at the time. Ensuring a tactical victory may be the Obama administrations ultimate goal. If Gaddafi is killed, and his regime removed, who are his successors? If rebel, could some possibly be Al-Qaeda sympathizers? Governments in Iraq and especially Afghanistan installed following the overthrows, have been reported as being corrupt and embezzling state funds. Upon succeeding in toppling the regime, will the rebels begin fighting amongst each other as we saw in Iraq? The answer is simple, there is no such thing as an easy war. When you fight a war, you best be prepared to put it all on the line, or nothing at all. Why do we insist on entering wars(and that is exactly what this is, a war) that we fight at 10%? Since the German blitzkrieg’s on the European theater, overwhelming an enemy into defeat is a combination of air, land, sea power and most importantly, communication. Now that we have chosen to enter the Libyan campaign, we chose the rebels to side with, they are now our responsibility to take care of. We cannot fail them. Gaddafi is in talks with foreign leaders to negotiate a possible ceasefire. With the possibility of the worsening stalemate, Obama may come to a compromise with Gaddafi, something similar with Saddam Hussein in Iraq, a 12 year no-fly zone, that eventually would lead to his demise. Or, Obama could open up a front with tanks, infantry, and air cover to destroy Gaddafi’s forces off the map. The no-fly zone will eventually lead to one or the other. A withdrawal or compromise would be a huge victory for Gaddafi, and would show other dictators around the world that NATO and the US have no backbone. The one aspect that is on NATO’s side is time. Stalemates do allow for well calculated decisions for both sides, but who does their homework is up to the belligerents involved. This would leave NATO with the decision power to compromise or go “the shores of Tripoli” as we did in Baghdad, or have 12 years of a no-fly zone before the inevitable.